Whether you’re throwing a Super Bowl party to watch the big game featuring the New England Patriots or the Los Angeles Rams, the commercials or you’re just interested in the snacks, these Super Bowl party ideas from our House of Ideas experts will give you all the tips and tricks you need to throw a memorable 2019 Super Bowl party! Get ready to party and send your guests home with these DIY football favor bags for your Super Bowl LIII party. They’re so easy to make – you probably have everything you need already at home! This football party table is easy to set up with some cans of soda and treats placed in special football party treat cups. Your guests won’t wait to dig in! 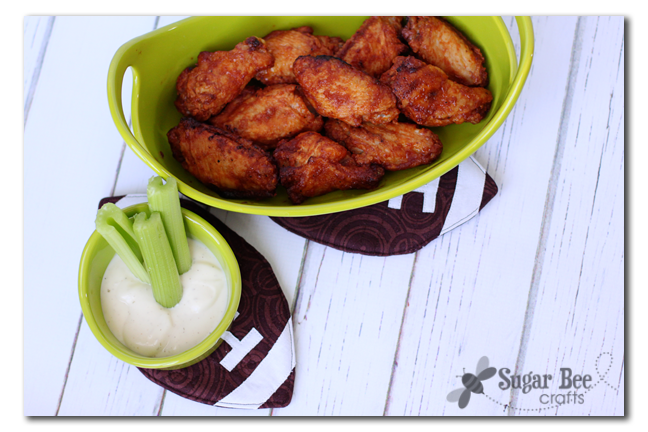 Celebrate your favorite team with this football tailgate party from Tammy! No matter whether you’re rooting for the Los Angeles Rams or the New England Patriots during the big game, these ideas can be easily tailored to your favorite team. This sports pennant works for any team, so it’s easy to tailor for the Rams or the Patriots! Customize your felt colors and you’ll be able to celebrate your favorite professional, college or even high school football team. Get ready to score a touchdown with these Super Bowl LIII party ideas from Mariah. Her awesome nacho bar means that hosts can spend their time socializing with guests rather than refilling snack trays. If you’re looking for something different than the normal wings and chips, these 2019 Super Bowl party ideas from Mariah include a spicy, creamy cracker spread made out of jalapenos, corn and cream cheese. For a sweet treat, dip crackers partially in bittersweet chocolate and then sprinkle with crisp bacon. The taste will surprise you! If you’ve never thrown a football party before, these tips by Mariah will make entertaining a breeze! Check out her ideas and don’t forget to put your own spin on your party for a one-of-a-kind experience for your guests. Score big with this vintage themed football party from Michelle! It’s sure to be a hit with your guests and it’s easy to adapt to celebrate your favorite team. Get ready to score with these fun-filled football party ideas. They’re perfect for kids and adults, whether you’re watching the big game or celebrating a win with your child’s football team. Before the Ready, Set, Hike, it’s time to huddle! This “Let’s Huddle” football pillow and SVG cut file from Tauni will get your home ready for Super Bowl LIII! These fall football party favors could not be easier, but also could not be cuter! Put some chocolate candies in a favor tube and add some cut vinyl to the tubes to look like a football’s laces! Add this free football printable and you’ve got a football party favor that your guests will love. If you have 10 minutes, you can make this simple football party banner from Tauni. It’s so easy that you’ll want to make a party banner for every occasion! Need a quick project to add a big impact for your football party? This print, then cut file is simple to use. Once you have the paper strips cut out for the paper chain, let your kids help put everything together. They’ll love the project and will be so proud of the finished product! These DIY football coasters pull double duty at your football party! They add a fun touch to your tables, but they also make a great place for your guests to place their drinks and protect your tables. If you’re not a big football fan, let everyone know just what you love most about football – the snacks! This I’m Just Here for the Nachos cut file is perfect if your interests are more food than football. Invite your neighbors over for a tailgate party and you’ll be known as the neighborhood hostess with the mostess! If the weather is nice, don’t forget to include your porch in your party preparations! This football party favor printable by Lindi is the perfect send off for your football party guests! Print it out and use it as a bag topper for your football party treats. These adorable football party banner printables are so cute and a great way to easily set the mood for your football party. Just print them on plain white cardstock, cut them out and string them up behind your food table. This fun football backdrop pulls together in minutes with these free printables and some paper fans. It looks great behind a food table or as a DIY photobooth. If you’re bringing food to a friend’s football party, you can’t go wrong with including these football shaped pot holders. They make a great one-of-a-kind hostess gift too! This football poster printable from Kim is the cutest addition to your football party backdrop. After the party is over, it makes a great poster for a kid’s room or even a man cave. These football party ideas are the perfect start to planning your own 2019 Super Bowl party. No matter if you’re having a fun family evening at home or you’re throwing a party for all your friends and neighbors to cheer on the Rams or the Patriots, see how these football party ideas can help you throw an unforgettable evening of food and football.